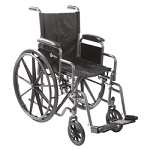 The Roscoe K7-Lite Wheelchair combines durability and flexibility in a robust design. 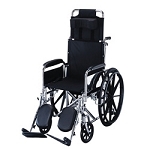 This model features a heavy-duty slide-tube frame, 5/8" diameter dual axles, and long lasting, double embossed seat and back upholstery. 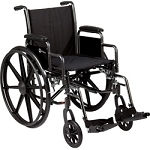 It has an attractive silver vein powder-coated steel frame and chrome handrims. The dual axle and multi-position caster forks provide for easy transition of seat height to hemi level. Sealed bearings in fork housing on rear and front wheels keep dirt out and are maintenance-free. Padded desk-length arms are removable and can be reversed for a full- length feel. Chart pocket on backrest and tool-free industry compatible front riggings come standard. • Product Weight: 57 lb. • Weight Capacity: 450 lb.